Betfred have launched a fantastic £10 no deposit free bet for all new mobile customers, as seen on tv. 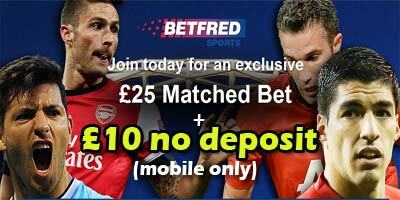 You will also receive a £25 matched free bet on your first deposit! Find here all the info you need! Note: The bonus is device sensitive, if you are on a desktop pc the page will show the £25 matched free bet while mobile will show the new offer - £10 No Deposit + £25 matched. No catches, no devils in the detail, just a COMPLETELY FREE £10 to get on Betfred Mobile outstanding, exclusive football bets featuring more ways to win, bigger odds and cracking bonuses! With English football already started and Premier League, Serie A, Ligue 1, Bundesliga, La Liga, Champions and Europa League rapidly approaching, now is the time to bet with the bookies’ money and you could be in profit without depositing! To get your £10 free bet, all you need to do is open an online account here , and the money could be in your account in as little as 24 hours. Once you have taken advantage of your no strings attached free bet, if you wish to place a bet of £25, Betfred will give you a free bet to the same value, up to a maximum of £25. 3. New customers registering through Betfred.com via desktop or a laptop are not eligible for the Free Bet offer. 7. If the Free Bet selection is void or a non runner then the Free Bet stake will be returned as a Free Bet. 8. The Free Bet stake is not included in any winnings. 9. The Free Bet is valid for 7 days, and will expire if not used within 7 days. 11. Betfred.com Remote Betting rules apply. 12. Betfred.com reserves the right to withhold any bonus payment if it believes that the promotion has been abused and/or where the terms of the offer are not fulfilled, or any irregular betting patterns are found. The decision of the Betfred.com management is final. "Free 10 pound bet at Betfred.com! No deposit required! (Mobile Only)"